Marissa Gross, Jaymie Bresso, and Samantha Hillborn perform at 4th Wall's annual summer camp at the Detroit Opera House. A growing number of programs across the country are trying to change that. And Michigan's 4th Wall Theatre Company is one of them. “We decided to reverse that and break the fourth wall in other direction, meaning anyone can come from audience onto the stage and participate. So, we open the door to everyone of all abilities to come and participate in the theater,” said co-founder and artistic director Annie Klark. 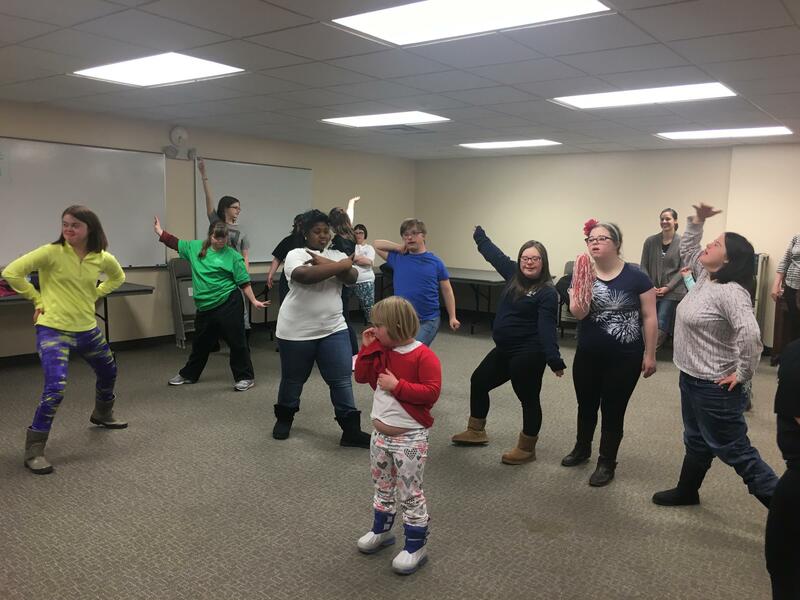 4th Wall is a mobile theater company and teaches classes all over the state, but its longest-running program is with the Down Syndrome Guild of Southeast Michigan. When I visited their weekly rehearsal, the students were about four weeks away from their final show. In a spare room at a Bloomfield Hills church, they were working on nailing down their choreography to Kool & the Gang's Celebrate. Actors in the 4th Wall Theatre Company strike a pose during rehearsal for their final showcase. This is the same place where Klark and her friend Katie Mann taught the very first 4th Wall class. It started out as a hobby. "We didn't know if the community would respond to this or if they even had a need for it," said Mann. The first class had just six students. Now, Mann says the company teaches in over 100 different locations across Michigan and has taught more than 5,000 students with disabilities. And the students in 4th Wall classes aren't just learning to be actors, singers and dancers. They also have a hand in writing and producing their final showcase. They help pick out storylines, settings and characters for an original play. Sometimes that means you have Dorothy from Oz and a vampire on stage at the same time, but they make it work. “A lot of times moms will call me and say ‘This sounds great. But my child doesn’t speak. They’re nonverbal. Can they still come?’ Of course! We’ve connected iPads to speaking systems and used the tablet to have them speak. We’ve had students hold up posters to speak, and we’ve had students just do a gesture, a thumbs up or something," Mann told me. Neuropsychologist Blythe Corbett says there might be something to that. Corbett is the director of the S.E.N.S.E. Lab at Vanderbilt University, which studies the social functioning of kids with autism. Corbett’s lab wanted to see if they could actually measure the therapeutic value of theater for people with autism. And what they found was promising. Kids who participated in the lab's theater camp spent more time interacting with new peers on the playground. Kids who participated in the lab’s theater camp spent more time interacting with new peers on the playground. They also got better at remembering faces, something that can be a challenge for people with autism. I asked Corbett if she could ever see a doctor writing out a prescription for theater. "I would love it. I think it would be fantastic. I think we need to change our view of what we call treatment," said Corbett. 4th Wall parent Alexa Ruhfass told me the benefits of theater go well beyond the students themselves. Her daughter Selina Wiesenberger has performed in 4th Wall for a few years now. Selina is the oldest of Ruhfass's three kids. 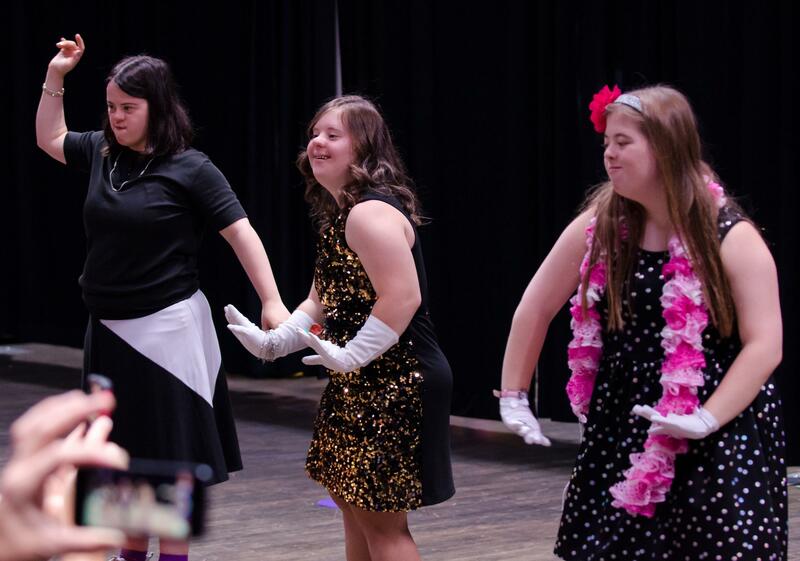 “And when they came here for a performance my other kids were 'There are all Selinas!’ They saw 30 people with Down syndrome, young adults in one place and my other kids were just thrilled” said Ruhfass. Rufahss says her daughter has thrived at 4th Wall. She’s met a big group of new friends. And she's even performed on stage, in front of thousands of people, at Detroit’s historic Fox Theater. “How many parents can say that?" Ruhfass asked. "Okay, my child has a disability. So what? She’s a star. I think that’s great." What 4th Wall gives Selina, and the other actors in the program, is a place to shine. Karen Wang calls her house an autism house. She does have a son who is 13 and autistic, but she’s kind of talking about the décor. "The sofas are in bright mismatched colors," she says. There are two pinball machines in the room, with fitted black fabric covering them right now. "Following the pinball helps with visual tracking," she explains. "Everything has a therapeutic purpose." Michigan Alliance for Families has created a video, "Making the Most of Early On," with useful info on accessing free resources to help little kids with disabilities. State of Opportunity has reported on whether schools comply with the Individuals with Disabilities Education Improvement Act (IDEA). Some school districts go above and beyond to make sure kids with physical and learning disabilities receive the equitable education opportunities they're entitled to, but others...not so much. What difference does art education really make anyway? Only a handful of public schools in Grand Rapids still offer art classes of any kind. To fill the gap, the West Michigan Center for Arts and Technology (WMCAT) offers free art education at their facility in downtown Grand Rapids. State of Opportunity's Story Booth stopped by WMCAT this summer. The booth goes out across the state to capture stories we might not otherwise hear. Teenagers participating in various summer art education programs shared stories about what art means to them.